If listening to bedroom pop artists can often feel like reading a diary, listening to ARTHUR is like trying to decipher the doodles that are scribbled on the cover. Surreal yet personal, skewed yet intimate, his songs invite the listener inside them, before spiralling away in unpredictable and effervescent directions. The Pennsylvania born-and-raised artist has collaborated closely over the past few years with the British independent dance lable PLZ Make It Ruins, the brainchild of producer Vegyn. He’s released three EPs with the label, each showing his skill for songwriting reminiscent of Daniel Johnston or Connan Mockasin; and together with Vegyn, ARTHUR appeared last week on Frank Ocean’s midterm elections special of blonded RADIO, chatting politics and making it personal. 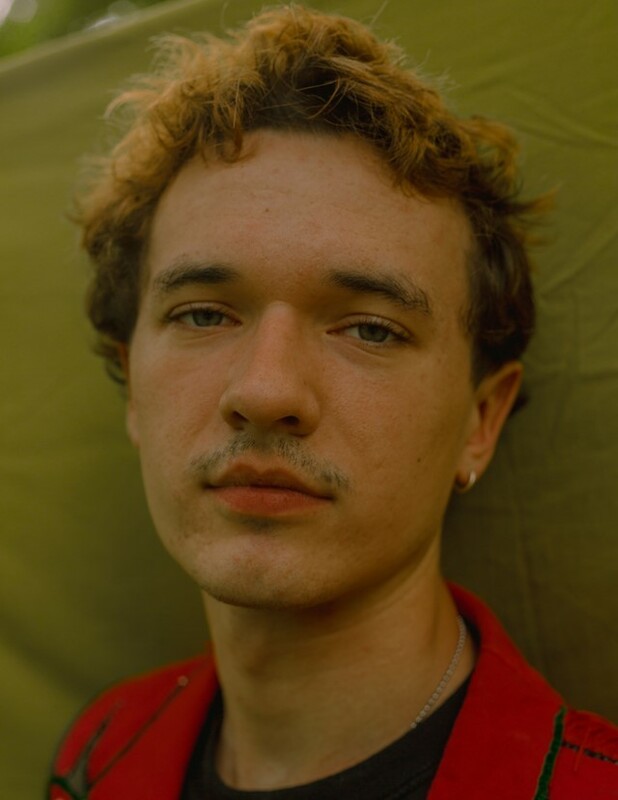 Today, as he releases his debut full-length album Woof Woof, Dazed quizzed ARTHUR on what inspires him, what songs make him cry, and why he makes music with the mindset of a dog. Dive in below, and watch his video trilogy to get into the trippy world of Woof Woof. What was it like growing up in Delaware County? ARTHUR: It was very calm at points; my mom and dad live in the woods. I went to Catholic school for first-eighth grade, and that kind of twisted me up for a while, but I found solace through playing a lot of SNES and N64 games with my sisters and brothers. It’s still my favourite place to be, because I was very privileged to get to grow up in a quiet part, with six siblings to push me along. There’s a lot of weird things about the county, but I think it’s the same for anywhere you grow up. Can you tell us a bit about how you first started making music? ARTHUR: My dad bought me a mandolin when I was maybe nine or ten, and I hated it, and never wanted to have anything to do with music. Later on, I had to borrow my brother’s bass for a spring concert in middle school where we pretended we were playing “Don’t Stop Believing’ by Journey. It was funny – my brother just gave me his bass after that, because he didn’t feel he could be very good at music at all. I started playing around by myself, recording music on any of my dad’s many computers, and being a loner, I got addicted to the kind of false godliness recording music presents you. I love to think how exciting it is that any kid with a computer and a version of Ableton can lift themselves out of whatever crummy situation they may be experiencing and channel that into music. When and how did you get involved with the PLZ Make It Ruins crew? ARTHUR: A mutual friend of ours showed my music to Joe (Vegyn), he really liked it and wanted to put it out so we just went with it. You've talked before about being inspired by the Beach Boys and Daniel Johnston. Where else do you get your inspiration? ARTHUR: It’s cheesy at this point, but really a lot from the memories of playing video games with my family when I was little. I get it from my friends, too. I’ve been having a hard time listening to music, I don’t really think about music when I’m making it. It just comes from the beauty that can only exist within my mind, not within my actual reality. My ears are kind of bad, and they are really sensitive if I listen to too much music it starts to sound like mush. Really good movies or TV shows are helpful. Is there a narrative arc to Woof Woof? ARTHUR: In a way, yes. It’s kind of like the entire earth collapsing on itself, but in the way that I can tell that story. It’s just all ups and downs, lefts and rights. It was kind of a disastrous period of my life when I recorded the album, and I didn’t want to make the music sound like it. It’s whimsical. The world is closer to ending every day, and that doesn’t have to be the saddest thing. Why is the album called Woof Woof? ARTHUR: I like to think of myself like a dog. I’m not the brightest in the world, and I’m terribly impatient. Seeing the world through the eyes of a dog is fun. You don’t have to try and understand things in such an intricate way, which can be very difficult, especially trying to navigate your normal everyday social responsibilities. I try to record music like a dog. I want it to just be very natural and loving and strong, ignorant and in its own world. It’s easy for me to describe the music that way. Like a dog with its tongue out, barking into the woods at night, not knowing the dangers that await should it decide to enter. ARTHUR: Nothing now... Last thing I read was two Murakami books. Hard-Boiled Wonderland and Wild Sheep Chase. I really relate to the characters in the two books, because they’re kind of listless, but the stories are so magical and push them to feel something more. ARTHUR: I can’t really remember. Probably “Run Angel Run” by Tammy Wynette or “Peaches En Regalia” by Frank Zappa. The first is a sad cry, the second is just really exciting for me, and reminds me of when I first heard it at 14 and was forever changed. ARTHUR: Hopefully doing most of the same, but in a more secure way. I want to have a place where I can play drums inside and have a big dog. I don’t like the whole ‘five year plan’ thing people talk about, because I don’t even know what I’m going to eat tomorrow, and everything in your life can change in two minutes. I don’t want to plan for years, only for the next half hour or so.